Ratatouille, I’m sure you’ve heard of it. It’s a fancy French name for cooked provincial vegetables, consisting of eggplant, peppers, garlic and tomatoes. It’s one of my favourite dishes, yet I can forget to cook it for months at a time. How can this be? 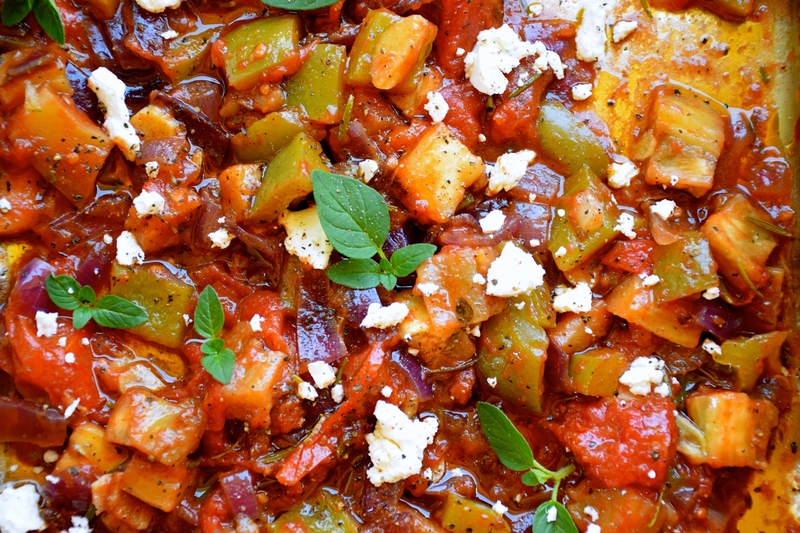 What I love about this ratatouille recipe is everything is popped into one tray. You will need lots of extra virgin olive oil. But that’s not a bad thing. I recently heard Ottolenghi talking about how much virgin oil he uses when cooking eggplant. He advised, use lots, then use more. So don’t be shy. 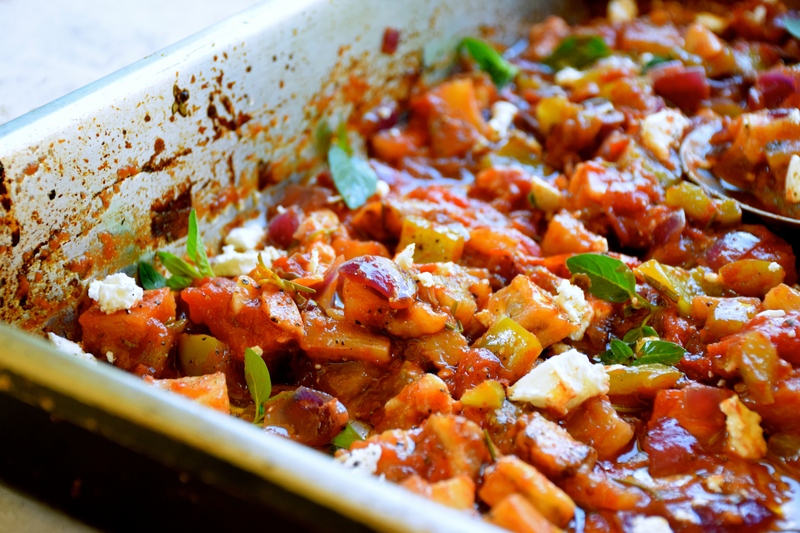 The ratatouille vegetables are covered with foil and roasted in the oven. The flavours have no other choice than to blend together. This method also ensures the eggplant is soft, just the way properly cooked eggplant should be. The peppers and onions take on a sweetness from the tomatoes and finishing the dish with vinegar and brown sugar sharpens all those flavours. By all means, you can replace the tinned tomatoes with fresh ones. If doing this, four would probably be enough. I had tinned on hand this particular day and as long as they are whole tinned, you can then squeeze the tomatoes in your hands and squash them to the desired consistency (this is actually quite fun). There are times where I desire soft goats cheese. I like to crumble chunks of it into the warm ratatouille. It adds a creaminess that is irresistible with the tomatoes. You might consider giving this a try. The obvious first choice of serving ratatouille is with pasta. You can’t go wrong here. Toss 2/3 of the ratatouille through your al dente pasta, spoon into bowls then top with the remaining ratatouille, crumble over extra goats cheese, black pepper and fresh herbs. 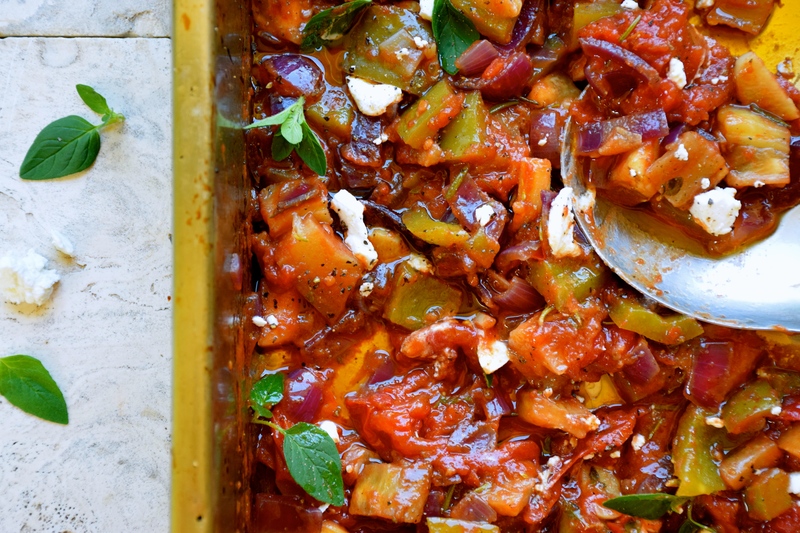 Ratatouille makes an excellent side-dish that you might serve with fish, lamb or chicken. Or it can be eaten spread on toasted baguette as a light lunch. When given a chance to lessen the dishes, I take it. I revel in it. One tray food, yes please! Peel the eggplant and cut into 1cm dice, place in a large baking tray. Add the onions, peppers, and garlic. Squeeze the whole tomatoes, in the palm of your hand, onto the vegetables (or if using fresh ones, chop them into a rough dice). Drizzle with lots of extra virgin olive oil, season with sea salt and black pepper, sprinkle with rosemary and oregano and toss gently to combine. Cover with foil and roast for about 45 minutes, or till eggplant is soft. Remove from oven, add the vinegar and sugar, toss gently till sugar dissolves. Allow to cool slightly then sprinkle with goats cheese and fresh oregano (if desired). I hate the washing up too! 😀 and definitely yes to one-pot dishes! That’s why I make many dishes in the oven!